Happy.....Monday! We're on holiday schedule, folks. I'm eating marzipan straight from the tube and wrapping presents to myself from myself. Wooooo! 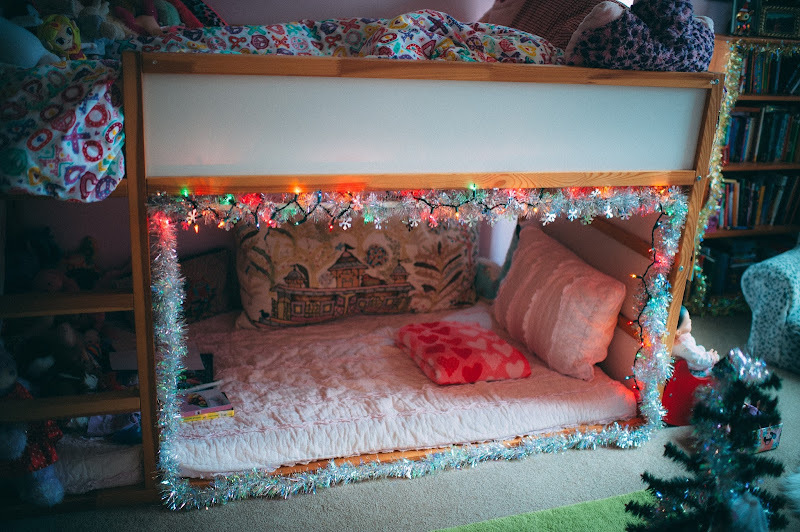 Up in the photo you can see that I decided to holiday bedazzle my kiddo's bed. And her boookcase. The look on her face when she saw it -- that right there was my Christmas present. I'm good. Last week was nutty - car wrecks all over the road, colder than I've ever known it to be around here in years and years, and errand after errand after errand. I really need to clean the house. But instead, I'm just going to keep eating plain marzipan and that there is my Christmas Plan. Oh hey - all new and festive 5 Hours 'til Bedtime post is up and running, go see! My friend Amelie told me that the film 'Journey to the Christmas Star' is on Netflix right now and that it's filled to the brim with Scandinavian Christmas goodness. I can't WAIT to see it! I showed this Unicorn Hot Chocolate to Julia and her jaw dropped open, literally. Looove this Christmas tree alternative! Photo wall stickers. Very cool idea. Icelandic folk tales? I NEED ONE OF THESE. A little Victorian table-top Christmas tree. 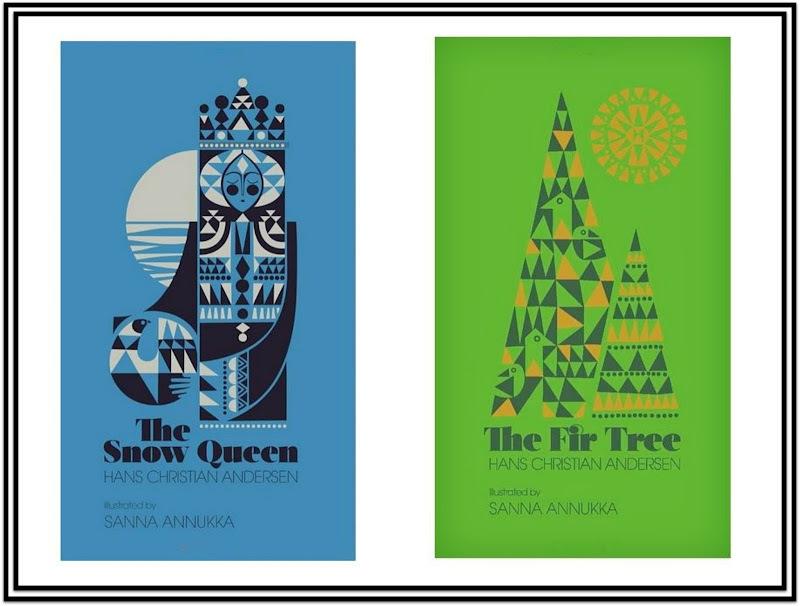 Cool Book(s) of the Week: 'The Snow Queen' and 'The Fir Tree' by Hans Christian Andersen, and oh so gorgeously re-imagined through the art of Finnish illustrator, Sanna Annukka. Both of these became available in the U.S this past autumn. I'm slightly obsessed with all things Snow Queen related, more on that topic coming after Christmas. So I'm always happy to see any version of it! I'm knocked out by the geometric art style of Annukka's work - it's bold, strong and vibrant. The books have cloth bound covers and are representative of Scandinavian folk art. 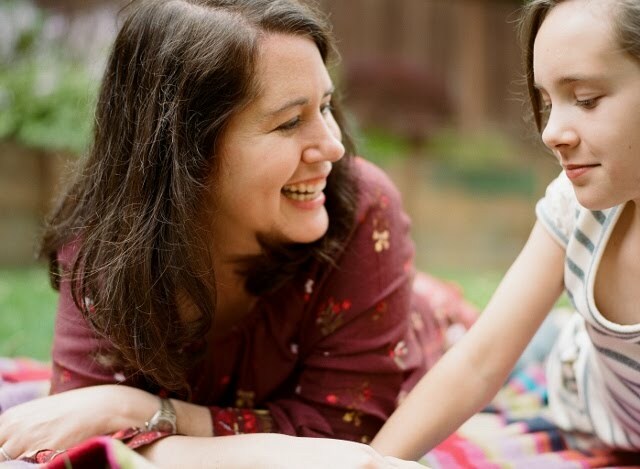 'The Fir Tree' is not the happiest fairytale, but it's one you never forget. I think Andersen's fairy tales are soul punchers, a lot of them ('The Little Match Girl' anyone?? ), but so so so hauntingly beautiful. Have a lovely day, and hey Winter Solstice on Wednesday! I'll be back before Christmas (I hope) with a simple Christmas cookie recipe. If not, I'll hit you with it on Boxing Day!